On February 19th, the birthday of Nicolaus Copernicus, Professor James G. Fujimoto was awarded the Honorary Doctorate Degree at the Nicolaus Copernicus University in Poland. 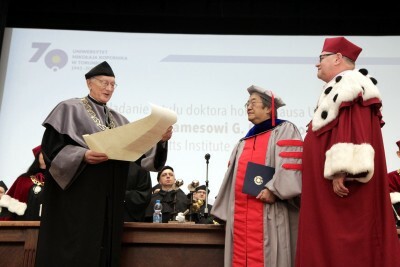 Professor Fujimoto was awarded the University’s highest academic distinction, Doctor Honoris Causa, by Rector Andrzej Tretyn and Dean Andrzej Kowalczyk in recognition of his contribution to the fields of biomedical optics and medicine, his training and mentoring of young scientists, and his service to the international scientific community. Presentation of the Honorary Doctorate to Prof. Fujimoto by Dean Andrzej Kowalczyk (left) and Rector Andrzej Tretyn (right), photo by Andrzej Romański. The Copernicus University, located in Torun, Poland has over 30,000 students and includes faculties of Economics, Education, Law, Medicine, Political Science, and Physics as well as numerous faculties in arts and sciences. Nicolaus Copernicus’ work De revolutionibus orbium coelestium (On the Revolutions of the Celestial Spheres) described the helio-centeric solar system and is considered a key result in the history of science. His vision led to a profound change in the perception of mankind’s place in the universe, while reinforcing the critical role of scientific and analytical methodology. Without careful scientific methodology or systematic analysis, first perceptions and beliefs are often incorrect. Copernicus was a multidisciplinary person, astronomer, mathematician, physician, literary scholar, economist, diplomat and expert on Canon law. His broad, multidisciplinary training enabled him to transcend the historical limits of vision and correct a fundamental error in mankind’s perception of reality. In his commencement speech, “The limits of vision – and how we might transcend them”, Prof. Fujimoto commented that the high degree of specialization in modern science, technology, medicine and society requires years of focused training which can limit of vision and lead us to a narrow perception of reality. Progress has been so great that it is now almost impossible for a single person to have the depth and breadth of knowledge that Copernicus did. In order to extend the boundaries of knowledge, advance health care, create new economic opportunities, or make other positive contributions to society, it is increasingly necessary to work in multidisciplinary teams. Not only is it critical to work collaboratively, but it is also important to develop an understanding of the how other disciplines perceive reality, approach problems and create solutions. Current biomedical research represents an example of how multidisciplinary approaches can lead to powerful advances in patient care through collaboration and interaction among scientists, engineers, clinicians, business and government. Professor James G. Fujimoto obtained his bachelors, masters, and doctorate from the Massachusetts Institute of Technology in 1979, 1981, and 1984 respectively. He performed his doctoral studies under the supervision of Professor Erich Ippen in ultrafast optics. Since 1985 Dr. Fujimoto has been in the Department of Electrical Engineering and Computer Science and Research Laboratory of Electronics at MIT where he is currently Elihu Thomson Professor of Electrical Engineering. Dr. Fujimoto’s group and collaborators were responsible for the invention and development of optical coherence tomography (OCT). His group’s landmark paper, “Optical Coherence Tomography,” which appeared in Science in 1991, ushered in a new era in clinical biophotonic imaging and has remained one of the highest cited papers in the field of biophotonics. Dr. Fujimoto and his collaborators have played crucial roles in many of the major innovations in the OCT field. OCT is now standard clinical imaging modality in ophthalmology for the detection and treatment monitoring of macular degeneration, diabetic retinopathy and glaucoma. There are an estimated 20-30 million ophthalmic imaging procedures performed worldwide every year. There are hundreds of researchers internationally working on OCT in such diverse fields as cardiology, endoscopy and cancer surgery. Last year, the global sales of OCT systems exceeded $400 million and there are more than 36 OCT systems companies. Dr. Fujimoto has been influential as an educator and has trained numerous researchers who became leaders in the fields of photonics and biomedicine. He is also active in scientific service, having served as co-chair of international meetings such as the Conference on Lasers and Electro Optics, the European Conferences on Biomedical Optics, and Ultrafast Phenomena. Since 2003 Dr. Fujimoto has served as co-chair of the SPIE Biomedical Optics symposium, the largest international meeting on biophotonics. He also served as a Director of the Optical Society of America from 2000 to 2003 and is currently a Director of the SPIE the International Society for Optics and Photonics. Dr. Fujimoto received the Discover Magazine Award for Technological Innovation in medical diagnostics in 1999, was co-recipient of the Rank Prize in Optoelectronics in 2002, received the Zeiss Research Award in 2011 and was co-recipient of the Champalimaud Vision Prize in 2012. He was elected to the National Academy of Engineering, American Academy of Arts and Sciences, and National Academy of Sciences. Dr. Fujimoto is also a Fellow of the OSA, APS, and IEEE. Working with Mr. Eric Swanson, Dr. Fujimoto was a co-founder of the startup company Advanced Ophthalmic Devices, which developed OCT for ophthalmic imaging and was acquired by Carl Zeiss. He and Mr. Swanson also co-founded LightLab Imaging, which developed cardiovascular OCT and was acquired by Goodman, Ltd and St. Jude Medical.